Halakic midrash on Exodus from the school of R. Akiba. No midrash of this name is mentioned in Talmudic literature; but medieval authors refer to one which they call either "Mekilta de-R. Simeon b. Yoḥai," or "Mekilta Aḥrita de-R. Shim'on," or simply "Mekilta Aḥeret" = "another mekilta." From it passages are cited, especially by Naḥmanides in his Pentateuchal commentary on Gen. xlix. 31; Ex. xiv. 19, xxi. 3, xxii. 12; Lev. xxiii. 24; and by R. Todros ha-Levi in his works "Sefer ha-Razim" and "Oẓar ha-Kabod" (MSS. in the Königliche Hof- und Staatsbibliothek, Munich; comp. M. H. Landauer in "Orient, Lit." 1845, vi. 182 et seq.). Until recently, aside from these quotations and some given by certain authors of the sixteenth century, as Elijah Mizraḥi in his commentary on Rashi's commentary on the Pentateuch, R. Shem-Ṭob b. Abraham in his "Migdal 'Oz" to Maimonides' "Yad," and R. Meïr ibn Gabbai in his "Tola'at Ya'aḳob" (p. 63b, Cracow, 1570), the only other extract of any length from the Mekilta de-R. Shim'on which was known was the one published by R. Isaac Elijah Landau from a manuscript of R. Abraham Halami, as an appendix to his edition of the Mekilta (Wilna, 1844). There were, therefore, various erroneous opinions regarding this lost work. Zunz ("G. V." p. 419, note a) considered it as a cabalistic work ascribed to R. Simeon b. Yoḥai. M. H. Landauer (l.c.) identified it with the Mekilta de-R. Yishmael, while J. Perles (in "Monatsschrift," 1858, pp. 145 et seq.) held that the medieval authors applied the name "Mekilta de-R. Shim'on" merely to his maxims which were included in the Mekilta de-R. Yishmael, since separate sentences could be called "mekilta". 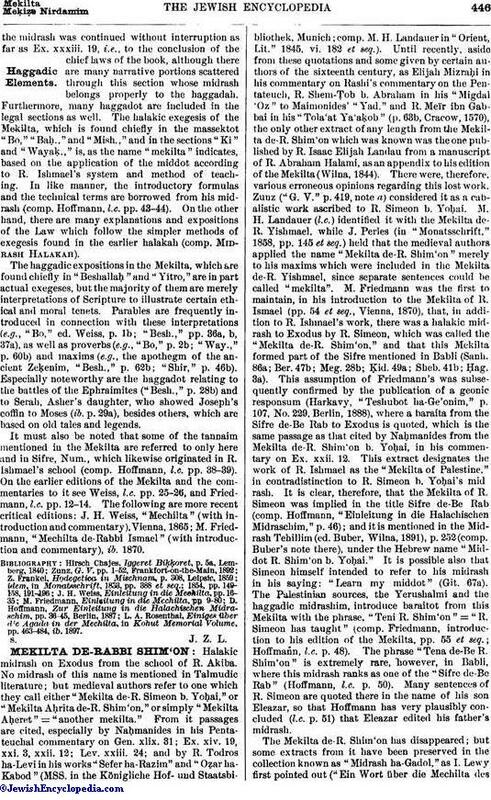 M. Friedmann was the first to maintain, in his introduction to the Mekilta of R. Ismael (pp. 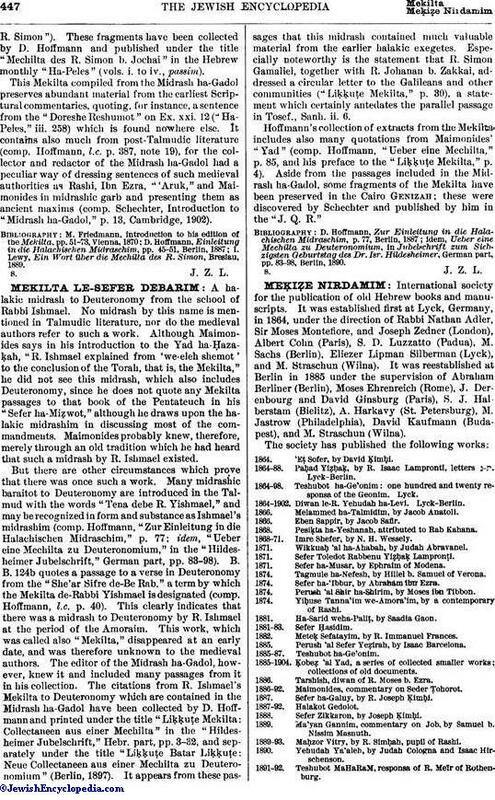 54 et seq., Vienna, 1870), that, in addition to R. Ishmael's work, there was a halakic midrash to Exodus by R. Simeon, which was called the "Mekilta de-R. Shim'on," and that this Mekilta formed part of the Sifre mentioned in Babli (Sanh. 86a; Ber. 47b; Meg. 28b; Ḳid. 49a; Sheb. 41b); Ḥag. 3a). This assumption of Friedmann's was subsequently confirmed by the publication of a geonic responsum (Harkavy, "Teshubot ha-Ge'onim," p. 107, No. 229, Berlin, 1888), where a baraita from the Sifre de-Be Rab to Exodus is quoted, which is the same passage as that cited by Naḥmanides from the Mekilta de-R. Shim'on b. Yoḥai, in his commentary on Ex. xxii. 12. This extract designates the work of R. Ishmael as the "Mekilta of Palestine," in contradistinction to R. Simeon b. Yoḥai's midrash. It is clear, therefore, that the Mekilta of R. Simeon was implied in the title Sifre de-Be Rab (comp. Hoffmann, "Einleitung in die Halachischen Midraschim," p. 46); and it is mentioned in the Midrash Tehillim (ed. Buber, Wilna, 1891), p. 252 (comp. Buber's note there), under the Hebrew name "Middot R. Shim'on b. Yoḥai." It is possible also that Simeon himself intended to refer to his midrash in his saying: "Learn my middot" (Giṭ. 67a). The Palestinian sources, the Yerushalmi and the haggadic midrashim, introduce baraitot from this Mekilta with the phrase, "Teni R. Shim'on" = "R. Simeon has taught" (comp. Friedmann, introduction to his edition of the Mekilta, pp. 55 et seq. ; Hoffmann, l.c. p. 48). The phrase "Tena de-Be R. Shim'on" is extremely rare, however, in Babli, where this midrash ranks as one of the "Sifre de-Be Rab" (Hoffmann, l.c. p. 50). Many sentences of R. Simeon are quoted there in the name of his son Eleazar, so that Hoffmann has very plausibly concluded (l.c. p. 51) that Eleazar edited his father's midrash. The Mekilta de-R. Shim'on has disappeared; but some extracts from it have been preserved in the collection known as "Midrash ha-Gadol," as I. Lewy first pointed out ("Ein Wort über die Mechilta desR. Simon"). These fragments have been collected by D. Hoffmann and published under the title "Mechilta des R. Simon b. Jochai" in the Hebrew monthly "Ha-Peles" (vols. i. to iv., passim). This Mekilta compiled from the Midrash ha-Gadol preserves abundant material from the earliest Scriptural commentaries, quoting, for instance, a sentence from the "Doreshe Reshumot" on Ex. xxi. 12 ("Ha-Peles," iii. 258) which is found nowhere else. It contains also much from post-Talmudic literature (comp. Hoffmann, l.c. p. 387, note 19), for the collector and redactor of the Midrash ha-Gadol had a peculiar way of dressing sentences of such medieval authorities as Rashi, Ibn Ezra, "'Aruk," and Maimonides in midrashic garb and presenting them as ancient maxims (comp. Schechter, Introduction to "Midrash ha-Gadol," p. 13, Cambridge, 1902). I. Lewy, Ein Wort über die Mechilta des R. Simon, Breslau, 1889.